We’re pleased to be here. What did each of you work on for the original game? Haruhana-san, would you introduce yourself first, please? I’m Haruhana from the Entertainment Analysis & Development Division (EAD). I did most of the modelling and animation myself for characters other than Link, whom (Yoshiaki) Koizumi-san was in charge of. That was before the work was divided up so much, so you had to do everything yourself. Yes. It was really fun, because you had control over everything yourself. I’m Takizawa from EAD. Haruhana-san made the characters, but I was in charge of the bosses and enemies. I had the honour of leaving these bosses I designed in the capable hands of Morita-san at SRD1 to create their movements. Each day, I enjoyed watching life being breathed into the bosses I had designed. 1SRD Co., Ltd.: A company established in 1979 that contracts to develop video game software programs and develops and sells Computer Aided Design packages. The head office is in Osaka, and their Kyoto office is inside Nintendo headquarters. I’m Miyanaga from EAD. I was in charge of the design of Hyrule’s landscape. Lots of different types of natural environments appear in this game. I was in charge of Kokiri Forest - the first stage - as well as Hyrule Field and other locations. You are quite the fisherman! You didn’t just do the programming, but you also wrote the script for the Pond Owner who appears at the Fishing Pond. Oh, that’s right! He speaks in the Osaka dialect, so I wrote sample dialogue and gave it to (Toru) Osawa-san, the script director, to brush up. 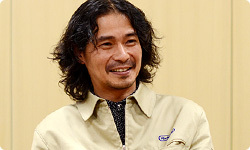 In addition to the dialogue, Morita-san made lots of requests regarding that character’s face and movements. He requested specific movements like this one (gesturing as if scratching his side) and even drew a rough sketch of how his face should look. Morita-san, did you make so many requests because that character was modelled after someone real? Yes, that’s right! (laughs) I like fishing and I’m from a town called Neyagawa in Osaka, and there’s a fishing store I used to go to in that neighbourhood. My model was the shopkeeper there. Later on, I’d like to talk to you more about the Fishing Pond. Okay. (laughs) I’m looking forward to it. Haruhana-san, Takizawa-san and Miyanaga-san, you were the core designers for The Legend of Zelda: Ocarina of Time, but you were all quite young at the time. Before that, what kind of work were you doing, Haruhana-san? In the days of the Nintendo 64 system, I designed the map for Super Mario 64.2 After that, I designed and supervised the UI (user interface) and demos for Star Fox 64.3 2Super Mario 64: The first 3D action game in the Super Mario Bros. series. Released simultaneously with the Nintendo 64 system in Japan in June 1996. 3Star Fox 64: A 3D shooting game released for the Nintendo 64 system in Japan in April 1997. Released under the name Lylat Wars in Europe. How many years have you been at the company? This is my eighteenth year. I joined in 1994. And you did work involved with the Nintendo 64 system right after joining? 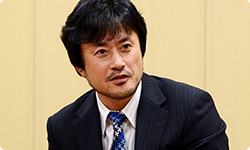 No, at first I received guidance from target=nintendo>(Yoichi) Kotabe-san4 and did artwork. My first real assignment was doing illustrations for Kirby’s Dream Course .5 4Mr. 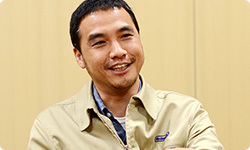 Yoichi Kotabe: One of Japan’s foremost animators. His works include the popular anime series Heidi, Girl of the Alps. 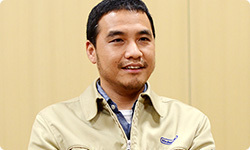 Later, he joined Nintendo, where he was involved in designing such characters as Mario. Currently he is active as a freelance agent. 5Kirby’s Dream Course: An action game released for the Super Famicom system in Japan in September 1994. 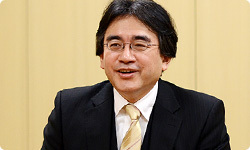 At the time of release, Satoru Iwata was president of HAL Laboratory, Inc., which developed the game. Hmm, I didn’t know that. Thank you for your work on that. Kirby’s Dream Course came out (in Japan) in September of 1994, right after you joined the company. Yes. After that, I drew illustrations for Super Mario World 2: Yoshi’s Island.6 I was involved with artwork, but when we were switching from the Super Famicom system to the Nintendo 64 system, I gradually started to help make the games. After development of Super Mario 64 began, I started working on the design of the natural landscapes in the game. 6Super Mario World 2: Yoshi’s Island: An action game released for the Super Famicom system in Japan in August 1995. Lots of people were brought in to help with the large-scale environmental design for that game. Haruhana-san, when you were placed in charge of character design for The Legend of Zelda: Ocarina of Time, could you see from the start what you had to make? According to the “class reunion” we had earlier, no one could see the goal toward which they were headed, despite running full steam ahead. (Takumi) Kawagoe-san, who was in charge of the cinematics, said the same thing! I just remember everyone plunging wholeheartedly ahead. I became able to do new things each day, and new characters rapidly came to life, so coming to work every day was a blast. The Nintendo 64 system was still new, so lots of graphics like we’d never seen before appeared. Each day was a fresh experience. Yes. 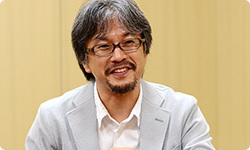 Iwata-san mentioned not being able to see the goal, but it was more like I didn’t even think about the goal! I just innocently focused on my drawing. That’s how fun every day was!